UNIVERSAL APP CAMPAIGNS · 8-MINUTE READ · By Misty Faucheux on September 18 2017. If you’ve been running an AdWords app install campaign, you might have recently received a notification informing you that app install campaigns will be phased out in favor of Universal App Campaigns (UAC). These campaigns have been around for nearly two years as an additional option. Now, they will take the place of app installs. While there may be some confusion on your part, this is no time to panic. This latest update will take some time to get used to, but it will be highly beneficial for you and your ROI. 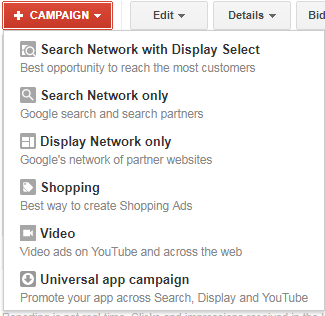 Before we dive into the new campaigns, let’s review app install campaigns. The purpose of an app install campaign was to get people to download your app. Similar to other campaigns, you could target specific types of users via contextual targeting, app ID, keywords, mobile operating system and more. The main difference between this type of ad and many others is that your ads would be only run on phones and tablets. Since the goal was to get someone to add your app to their mobile device, showing these on desktops or laptops wouldn’t make a lot of sense. We’ve all seen app install ads at some point in time. 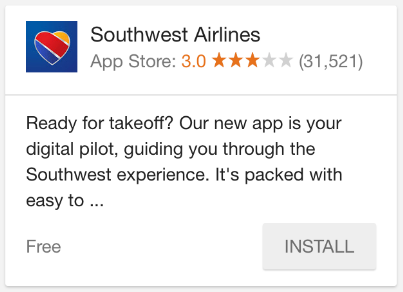 For example, if you’re searching on your phone for Southwest Airlines, something like this might come up. With app install campaigns, your ads were shown on the Google Display Network, Search Network (i.e. Google Play Search for Android Apps) and YouTube, but only a single network at a time. You had to create video, image or app install ads. App install ads on the Search and Display networks had to include app icon, description text and app store rating while ads on the Google Play network must have the app icon, app name, developer name, custom text and average rating. In the past, UAC was only used to target CPA while you can target CPC, CPV (YouTube) and CPI with app install campaigns. You can now do all of these with Universal App Campaigns. What Are Universal App Campaigns? While UAC work similar to app install campaigns, they differ really in three key areas. One, UAC leverage machine learning technology to locate customers that are most likely to download your product. Two, universal app campaigns do the work of building the ads for you. You simply select the app that you want to use, and AdWords will create the ads for you. You can upload your own video and image assets, but you don’t need to worry about actually creating the ads. Google will use what you have provided to produce ads for the mobile devices. This eliminates the pain of ensuring that your ads are the right size. The third difference between the two is that UAC can run anywhere across multiple networks within a single campaign, including Google Play, YouTube, Google Search and Display Network. One reason Google decided to permanently embrace the UAC is that they’re simply more effective. According to advertisers who have been optimizing for in-app actions with UAC, they’ve seen on average 140% more conversions per dollar over other Google app ads. Google likes to ensure that they’re advertisers are experiencing the best success they can. Yet, we should be cautious about this. In the past, mandatory changes have resulted in mixed results. For example, the expanded text ads didn’t do so well when they were first launched last year. Many companies held on to their standard text ads because they found that they were simply performing better. Unfortunately, we’re not going to get the opportunity to run standard app install campaigns next to UAC. According to Google, these campaigns will be immediately phased out. Yet, if everyone is forced to make the move, it might level the playing field and reduce the drastic differences we saw with standard and expanded text ads. Google recommends that you start with reviewing your current ads to determine the top-performing ones. You can download these assets, and upload them to the new UAC. Create your new UAC by clicking on +Campaign and selecting Universal app campaign. Give your campaign a name, and click on the app that you would like to promote. If it’s not already in the dropdown, you’ll have to add it. In the Ads section of this screen, you can enter up to four lines of text. These will be used on a rotating basis within your ads. In some cases, your text may not be selected in favor of images or videos. This is also the section where you can upload selected video or images, including those from previous campaigns. You can add up to 20 images, and they must be .jpg, .gif or .png files up to 150KB. You can also upload up to 20 YouTube videos. You can set your language as well as target areas on this screen. Google will not translate your ads into other languages so be sure that your selected languages match your text. Now, go to Campaign Optimization, and select whether you’d like to optimize your campaign for Installs (obtain new users) or In-app actions (perform actions within previously installed apps). You must set your bid targets, i.e. how much you’d like to pay per app install. Beneath the Bid Strategy, you’ll see a projection of potential install volume, similar to the range of impressions that you’ll see when you set up a Display network campaign. Finally, enter your budget, and select Save and continue. Do this for all your existing campaigns and any new app install campaigns that you wish to set up. If you have existing app install campaigns, you should start migrating one or two over to a UAC to test how the new campaigns work. Since you have until November 15th before your current app install campaigns will be shut off, take your time and figure out how these work and how to set them up. You should, however, ensure that you have everything moved to the UAC long before the cutoff date to prevent your campaigns from being permanently turned off. Put together a list of all of your app install campaigns, and select migration dates for each one of them, especially if you’re running multiple campaigns. Breaking up the migration process will reduce stress and guarantee that you have successfully moved your important campaigns to the new platform.